This week sees the celebrations of Chinese New Year. Each year celebrates a different animal, this year will be the Year of the Goat/Sheep (depending on translation). 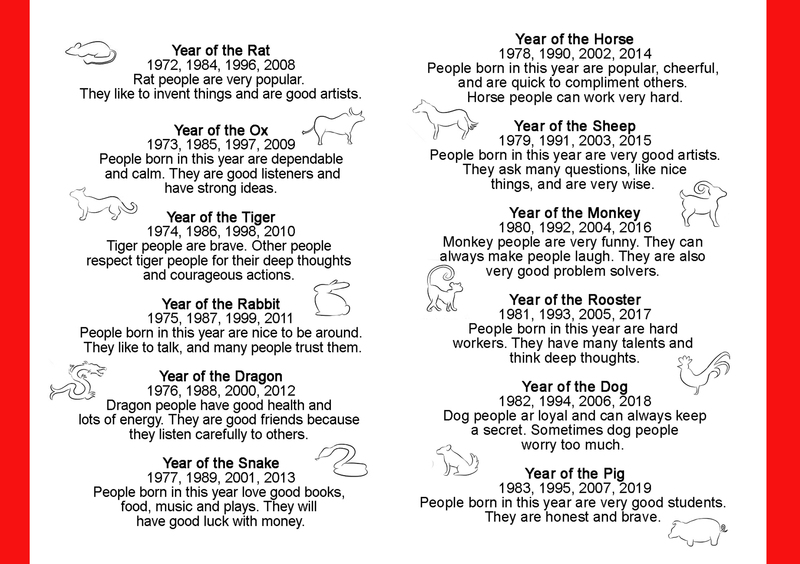 The Chinese Zodiac is based on a twelve-year cycle, each year in that cycle related to an animal sign. These animal signs are the rat, ox, tiger, rabbit, dragon, snake, horse, goat, monkey, rooster, dog and pig. It is calculated according to the Chinese lunar calendar. Which symbol is representative of your birth year and your child’s? Is the description accurate? Fancy making your own Chinese Dragon to celebrate the New Year? Find instructions and templates for your Dragon here.